At the end of the seven-races Dragon class series two teams emerged at the top tied at points: Ivan Bradbury’s Blue Haze and Russia’s Bunker Prince skippered by Yevgeni Braslavets. 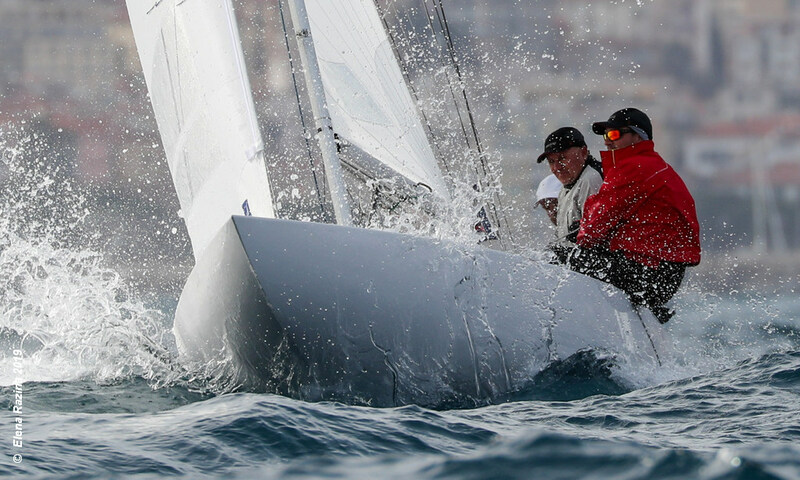 And it was Bunker Prince, skippered by Braslavets with Sergey Pugachev and Sergey Timokhov, who with the benfit of a higher number of wins, took the Paul & Shark Trophy 2019. Going into the last racing day the Russian crew of Bunker Prince, flying the flag of local Yacht Club Sanremo, looked almost unbeatable with their solid margin of 9 points, but the tricky conditions of the Ligurian Riviera reshuffled the cards. The final two races were raced with a light and shifty westerly that never exceeded 6 knots, putting to the test the dragonists’ ability and tactical skills. Race 6 went to Blue Haze helmed by Bradbury, with Anatoly Loginov’s Annapurna in second, whilst Bunker Prince only managed to get a twelfth, their worst result in the whole series. In the second race the win went to the team from Monaco Jeanie skippered by Jens Rathsack, with Blue Haze in second and Sweden’s High Times helmed by Karl Gustaf Lohr in third. Despite their consistent series the other Russian team on Annapurna, with veteran Anatoly Loginov and crew Vadim Statsenko and Alexander Shalagin, did not manage to further catch up and finished on the third step of the podium. Competition was intense also for the other first spots – prizes being awarded to the first five teams- with Germany’s Khaleesi led by female skipper Nicola Friesen with Vincent Hoesch and Frithjof Kleen, scoring two good results on the final day and taking fourth place, while Switzerland’s Sophie Racing with Hugo Stenberg, Bernardo Freitas and Martin Westerdahl finished the series in fifth. Yanez with skipper Giuseppe Duca, Jean-Sébastien Ponce and Vittorio Zaoli racing for Compagnia della Vela di Venezia were the first Italian team and awarded with the national title.